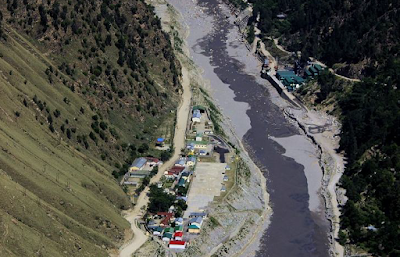 A top civil society source has revealed that the Cumulative Impact Assessment (CIA) studies of several big and small hydropower projects for Himachal Pradesh's three major river basins, Sutlej, Chenab and Beas, have either been completed are in the process of completion. However, for most of these, little or no local consultation, as required by law, has been carried out. A letter dashed to state environment secretary Manisha Nanda, who also heads the chief minister's office, by civil rights network Himdhara Collective has alleged, these studies have been found to be a mere formality, "as the process of giving environment and forest clearances for hydro projects has been de-linked from the CIA process." Demanding that until complete studies are carried out there must be a moratorium on further hydro development in the state, the letter, which is based on an in-depth study of environmental assessment of all the rivers, says, there is, as of today, no "local community involvement in river protection". A 2016 study, "Dried & Dusted: State of the Rivers Report – Himachal Pradesh", it said, "Himachal has the largest hydropower installed capacity in the country." It has "installed 10264 MW worth of projects. It is planning to harness a total 27436 MW out of which 24000 MW of power is harnessable (Govt. of HP, 2015-16) from the five major river basins of the state namely Sutlej, Chenab, Ravi, Beas and Yamuna across a total of 813 large, medium and small projects and micro-hydels." "In such a scenario the nature of development is bound to impact the state of the rivers. In the next section we examine some of the major developments that have emerged as threats to the health of Himachal's rivers", the study believes. Basing on the study, the letter -- signed by representatives from Him Lok Jagriti Manch, Social Uplift Through Rural Action, Himalaya Bachao Samiti, Himalaya Niti Abhiyan, Sutlej Bachao Jiven Bachao Abhiyan Samiti, Himdhara Collective and Himachal Van Adhikar Manch -- calls Beas, Ravi, Sutlej and Lower Stretches of the Yamuna (tributaries) "already critically polluted" and "in the red", adding, the regulatory authorities are least concerned about fighting pollution. According to the letter, the State Pollution Control Board and the Irrigation and Public Health departments' roles have "either been made redundant or they have been working to ensure least hindrance to 'developers'." It adds, things wouldn't change for the better unless the "dilutions" made in the amendments in the Hydropower Policy of 2006 made in 2014 and 16, are withdrawn. The amendments, says the letter, have dilute "the process of No Objection Certificate (NOC) from these departments prior to approval of hydro projects", adding, "The role of these regulatory agencies needs to be strengthened with community involvement in ensuring compliance to existing legislations that protect rivers and riparian rights." Noting dangers posed by industrial pollution, the letter says, "Special attention needs to be paid to monitoring and regulation of industrial pollution in areas like Baddi, Barotiwala, Nalagarh and Paonta Sahib. Common Effluent Treatment Plants have failed miserably and an effort needs to be made to monitor pollution at the source as well as treat the effluents there." Industrial pollution is not the only hazard faced by the state's rivers. The letters says, despite the National Green Tribunal and High Court orders, things with regard to sand mining have not change. While following their orders it is Sand mining is is "regulated or even stopped, the revival would take place in a short period of time." The letter wants tourism and urbanisation as needing "serious policy measures that strengthen the role of regulatory agencies as well as work towards models that are not large and commercial in nature but small scale and community owned and managed." It adds, "Four laning projects and blind road widening are not just damaging forests but also increasing erosion and the siltation on our rivers." Seeking involvement of local community in protecting forests in order to stop erosion of rivers, the letter says, "The Forest Rights Act (FRA), 2006, if implemented in full spirit, will strengthen community control and ownership over forests around river basins. Unfortunately, the Himachal government has the poorest track record in FRA implementation with the forest bureaucracy impeding rather than facilitating the filing of claims process."